Some people watch football; I watch Congress. The fiscal cliff drama was my Superbowl and Rose Bowl wrapped into one. First, two septuagenarians negotiated a tax deal overnight, which was then approved in a bipartisan Senate vote at 2 AM. Then, we were treated to a House GOP rant and rave against a deal that cuts taxes for more than 99 percent of taxpayers, before closing out the night with the majority party being rolled on one of the most salient votes of the 112th Congress. Call the game! There’s plenty to be said about the events that brought us to a scaled-down tax deal to avert the worst of the fiscal cliff. For now, just a few thoughts as I don’t want to miss the post-game show. First, it seems the fiscal cliff was indeed a cliff, rather than a slope for both parties. The conventional wisdom before and after the November elections suggested that the Democrats had greater leverage in addressing the fiscal cliff, since deadlock returned tax rates to their pre-Bush levels. Democrats’ willingness to go over the cliff, the argument went, would put them in the driver’s seat and allow them to raise taxes on upper income taxpayers. In fact, the president’s ardent desire for a deal led him to break his commitment to set the threshold for tax increases at $250,000. As in the battles over shutting down the government and defaulting on the debt in 2011, the policy and political consequences of stalemate were deemed unacceptable by a Democratic White House and their congressional leaders. Going over the cliff would have tagged the Democrats with a governing failure. For their part, Republicans in the 11th hour blinked, seemingly motivated by a desire to avoid blame for pushing the country back into a recession. Certainly McConnell’s calling out to Vice President Biden to put some of the pieces of a deal back together suggests that leaders from both parties thought they would be better off with any deal than no deal. Despite the near revolt by House GOP (and half of their leadership) when confronted with a deal that raised revenues and cut very little spending, the desire to avoid blame for going over the cliff seems to have motivated House GOP to give up their fight at the end of the 11th hour. Second, on one of the most important House votes of the year, the minority ruled. The Hastert Rule (go forward only with the support of a majority of the majority party) has been displaced (at least for now) by the Boehner Rule (sometimes a majority of the majority has to be rolled for the sake of the party’s reputation). One might say this is evidence of the median voter model at work. Alternatively, we might consider this vote a reminder that parties and their leaders pursue a mix of goals, including the desire to protect the party’s electoral brand name. The sequence of events matters here because it started with the Plan B debacle in which the Speaker misjudged his conference and washed his hands of negotiations. By punting so late in the game, Boehner foreclosed reliance on the Hastert Rule. Given other leaders’ incentives to avoid going over the cliff, the Speaker had no leeway for re-crafting the package to avoid his majority from being rolled. Electoral considerations—avoid blame for blocking tax cuts and dragging down the economy—prevailed in Boehner’s willingness to allow a vote on the Senate-passed bill to go forward. Third, legislative scholars have noted for years that the rise in polarized parties has brought leaders to the fore in negotiating policy solutions on behalf of their rank and file. The incentives to legislate through brinkmanship at the 11th hour further fuel this dynamic, given the time constraints under which last minute deals are cobbled. What is so striking about the fiscal cliff drama is that polarization seems also to have undermined the capacity of legislative leaders themselves to bargain and compromise behind closed doors. The Obama-Boehner pairing failed again, relations between Reid and McConnell are in need of repair, and Boehner and Reid seem incapable of even being in the same room together, leaving the job to old Senate friends Biden and McConnell. Would incentives for a deal been strong enough to secure a solution had Biden and McConnell not had such a relationship? Political scientists tend not to put much stock in the relevance of personal characteristics—not least because it’s hard to gin up a counter-factual for testing the impact of leadership. But the spread of partisan distrust to the leaders themselves does make me wonder about how a negotiations over raising the debt ceiling will proceed. Finally, the fiscal cliff solution punted on the key fiscal issue of the day: How can the U.S. address its future fiscal sustainability? This week’s drama is a good reminder of the difficulty Congress faces in legislating solutions to long-term problems. Imposing costs today to secure benefits tomorrow puts legislators at risk for voter backlash. Myopic policies for myopic voters, Ed Tufte once wrote. 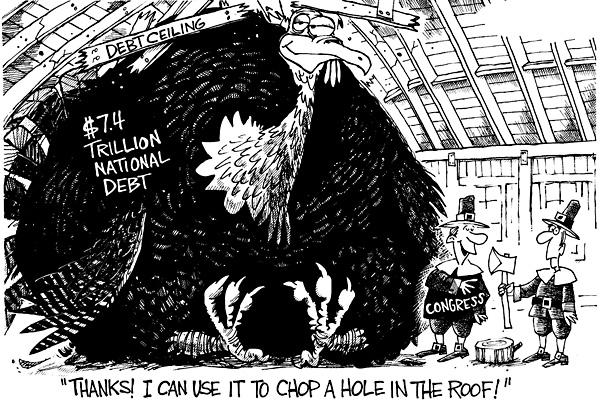 The result is that Congress more often plays a new round of kick the can than tackles solutions to its fiscal mess. This time, Republicans think they will have the upper hand, as the parties go to battle over what it will take to raise the government’s debt ceiling. I suspect any solution will involve a new set of future deadlines intended to force Congress to legislate. Deja vu all over again. Isn’t that exactly what he had set out to do? You’re right. Late night. Fixed! Great to see the Dems finally embrace the Bush tax cuts! Can we now start referring to them as the Bush-Obama tax cuts? That’s an interesting question concerning personalities. Would Reid and McConnell have found a way to come to a solution if Biden hadn’t been available? Would Cantor have felt compelled to back the deal if he’d been speaker? in my diary every day. I’d like to start a blog so I can easily share my experience and thoughts online. Please let me know if you have any kind of recommendations or tips for new aspiring blog owners. Thankyou!